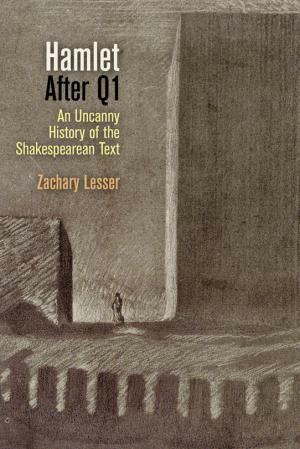 Professor Zachary Lesser was awarded the Elizabeth Dietz Award, given annually by SEL: Studies in English Literature to the best book in Renaissance Studies, for his Hamlet after Q1: An Uncanny History of the Shakespearean Text (Penn Press, 2015). Professor Lesser previously won the same award for his first book, Renaissance Drama and the Politics of Publication (Cambridge UP, 2004), and he becomes the first person to win the award twice. The judges for the award praised the book for showing "how meticulous book history can disrupt the assumptions of those critical methods--including both historicist and presentist criticism--that implicitly separate the meaning of a text from its physical instantiation." Hamlet after Q1 "makes a strong case for book history as an essential component of cultural, literary, or intellectual history, and has quite a lot to say as well about the contested prehistory of many of the assumptions about Shakespeare currently enshrined within our inherited disciplinary commonsense."